The Star Wars galaxy is a weird and wondrous place, full of laser swords, aliens, and sentient robots. This can make trying to depict the banality of life there a bit difficult. So over years of tie-in material, writers have had to come up with oodles of new words to make the normal things people encounter in everyday life feel like they’re part of a galaxy far, far away... with some truly ridiculous results. West End Games’ Star Wars roleplaying game of the late ‘80s—responsible for some of the early worldbuilding of what would become the Expanded Universe—infamously declared that there was no place for paper in Star Wars. The written word was noted on datapads and through electronic devices only. But eventually, not being able to just scribble something down at any time seemed odd, and so not only one, but two alternatives came to exist: Flimsiplast, a see-through acrylic, and durasheet, a “paper-like” material that was still not actual paper. But paper is just one of those things to intrinsic to real life that it became too weird to exclude from the Star Wars universe—a lot of stories felt the need to mention ancient books and tomes—that it kept popping up in places in the EU anyway, although it stayed incredibly rare. So flimsiplast and durasheet had to be given weird properties—anything written on flimsiplast could be erased by liquid, and writing on durasheet faded to nothingness after a short time time. In retrospect, it’s amazing “paper-flimsiplast-durasheet” isn’t a game in the Star Wars galaxy. You can’t just get away with drinking booze or various colors of milk in the Star Wars galaxy. The stimulating boost of coffee is universally recognized delight even in the galaxy far, far away... as long as you don’t call it “coffee.” Like other words on this list, various permutations were tried in the old EU, from Coffeine to Stimcaf (to really drive home that it was meant to perk you up, but in a spacey way). Caf is the only one that not only stuck around, but also hopped over to Disney’s canon, too—Mon Mothma and the crew of the Ghost enjoy cups of Spiran Caf on Star Wars: Rebels. Ah, Vibro technology, Star Wars’ easy way out when it comes to making something banal sound a little more scifi. Tons of gadgets we all know have been “enhanced” with a “vibro-” prefix in Star Wars. As the name would imply, this also gives them the power to vibrate at various intensities to strengthen their impacts, whether it’s the cutting edge of a vibroblade creating a nasty flesh wound, a vibrospade resonating to dig further into the ground, or a vibromop vigorously cleaning your floor (seriously). Vibrate everything! 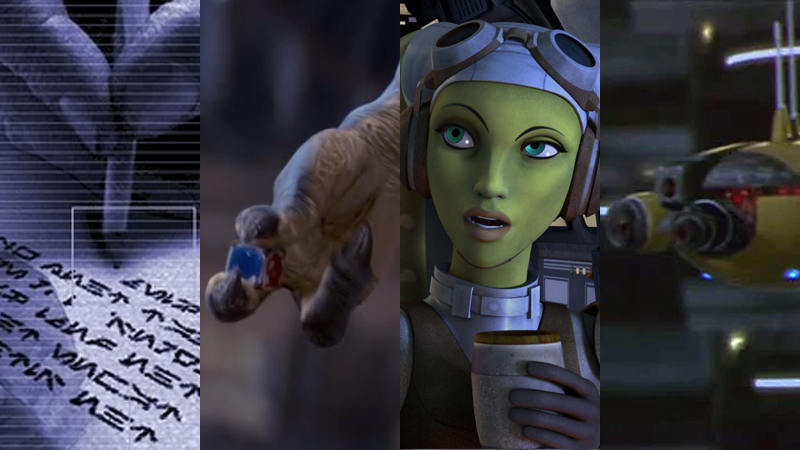 Despite a galactic love of gambling, dice as we know them don’t really exist in Star Wars... sort of. Chance cubes have the same six-sided, cuboid shape, but they don’t have numerical symbols on them—instead they have alternating colors, like the cube Watto uses to gamble Anakin’s freedom with Qui-Gonn. But there’s one very specific instance of “our” dice in Star Wars: Han hangs a golden set in the cockpit of the Millennium Falcon, ostensibly the pair he used when he won the ship from Lando Calrissian. In A New Hope, the dice were just standard, six-sided dice, barely seen in shots from the film. They were recreated as such for a scene in The Force Awakens, but were ultimately cut from the film altogether. When Rian Johnson decided to follow up with them for The Last Jedi, they were redesigned with alien symbols instead of dots. There are two kinds of cameras in Star Wars: The Holocam, which is usually used to describe video recorders or security cameras, and Imagers, which, well... image things. Except, they don’t! Because in Star Wars a picture is usually referred to as a Holo, rather than an image. So your guess as to why the name “imager” even exists is as good as ours. Image: The Screaming Citadel #1 art by Marco Checchetto, and Andres Mossa. “Gasser” is a wildly unappealing piece of terminology, but it might be down to the fact that the term originates with the Gungans—an exploding one is mentioned in Jar Jar’s list of crimes he was exiled for in The Phantom Menace. This might at least explain why it’s such a silly and weird term in the first place, but can you imagine putting your meal in a “gasser” without grimacing? Star Wars does have its own internet—the Holonet—so naturally, it has to have websites, ranging from news to entertainment to personal blogs. Kind of like Imager, it’s weird that the Star Wars term for a website isn’t more linked to its term for internet. But I guess when most visual forms of media are given “Holo-” prefixes, it might be a bit confusing to lump websites in there, too. How do you make your space watch seem spacier? Ancient Greek, apparently. Chronos, also known more formally as Chronometers, were (unsurprisingly) digital devices that were more like small chips that were attached to clothing than the wristwatches we’re used to. Bonus fun fact: Chrono is also the canonical, Star Wars equivalent of Time Magazine. Really! Duct tape, like the Force, binds all things together. A handy piece of kit for any aspiring starship engineer, tape has had a few names over the course of the EU, with varying degrees of scifi-ness added to make it sound fancier than duct tape ever should. There’s mesh tape, Spacer’s tape, engine tape... but you have to admire the simplicity and brazen silliness of space tape, which first appeared in Barbara Hambly’s 1997 novel Planet of Twilight. We&apos;re Reading Leia, Princess of Alderaan—Come Join Us!